Thanks Kalyani for giving me the opportunity to contribute to your amazing blog. Here is my recipe to Mushroom Biryani which I have been doing quite often after my marriage due to the simple reason that my husband is a vegetarian and I am a non-vegetarian. Biryani is a special lunch dedicated for Sunday I began missing eating chicken and mutton biryani when I couldn’t cook meat at home and thus mushroom biryani came on the menu to satiate our palate. I hope you enjoy making this recipe and if anyone has any questions I will be more than happy to answer them. There are a few initial preparations one has to start with. Once you have completed them then it is a very simple one-pot dish. 1.Wash (important) and soak the rice for 20-30 min. This should roughly be the time you take to do the first few steps of the dish. 2.Grind the ingredients under – ‘To Grind’. Add a little water to help the mixer jar turn and make into a fine paste. 3.Your next step would be to slice the onions and mushrooms. 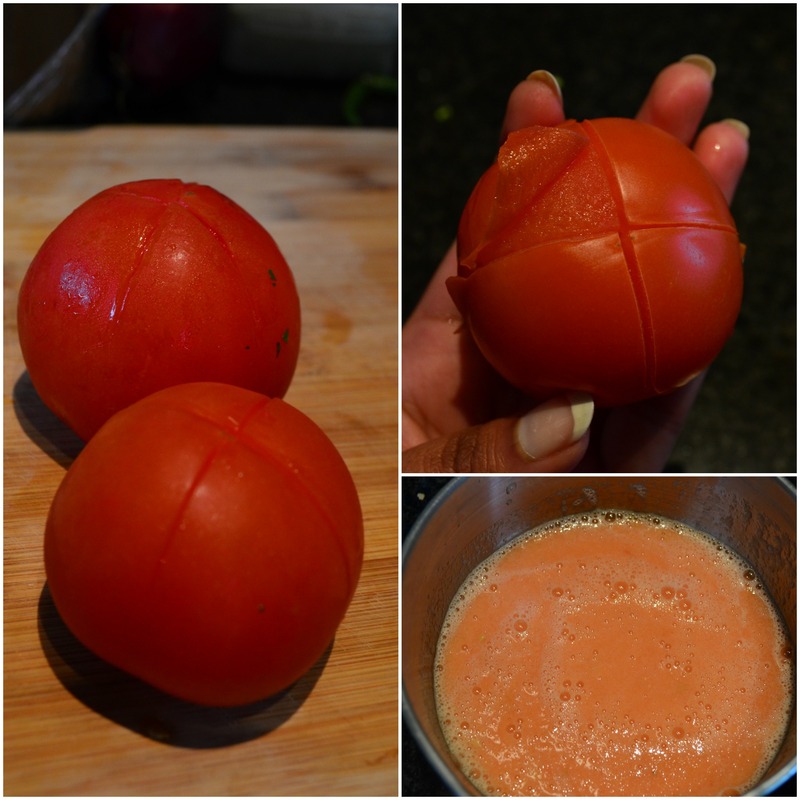 4.Tomato puree- I prefer making fresh puree for this through these simple steps. Take the two tomatoes and make a cross using a knife on one end of the tomato (See picture below). Drop the tomatoes in a pot of boiling water for 2-4 minutes. 5.Drain the water and let the tomatoes cool. Take each tomato and start peeling the tomato peel from the cross you made. It will feel like peeling a banana. You will be left with the pulp of tomato. Using a blender make the tomatoes puree. 6.Put a pressure cooker on the stove. Add ghee. And add the items under ‘To temper’. Then add the onions and sauté the onions for a few minutes. For Biryani- cooking the onions to a golden brown colour is one of the important steps as it gives a caramelised taste. 7.Next add the ginger garlic paste and cook until the raw smell goes away(approx 30 sec-1 min). 8.Then add the tomatoes puree and cook until it reduces and the raw smell goes. 9.Then add the grinder green paste of coriander and mint and cook until it all comes together and the raw smell goes. 11.Then add the mushrooms and mix it so that the masala coats the mushrooms well. In a few minutes the mushroom will start releasing water. At this stage add the curd. 12.Once everything is blended, drain the soaked rice and add it to the pressure cooker. Give a stir and add water. Add sufficient salt and pressure cook for 3 whistles. Once the pressure releases, open the lid add a few drops of ghee and fluff the rice using a fork. 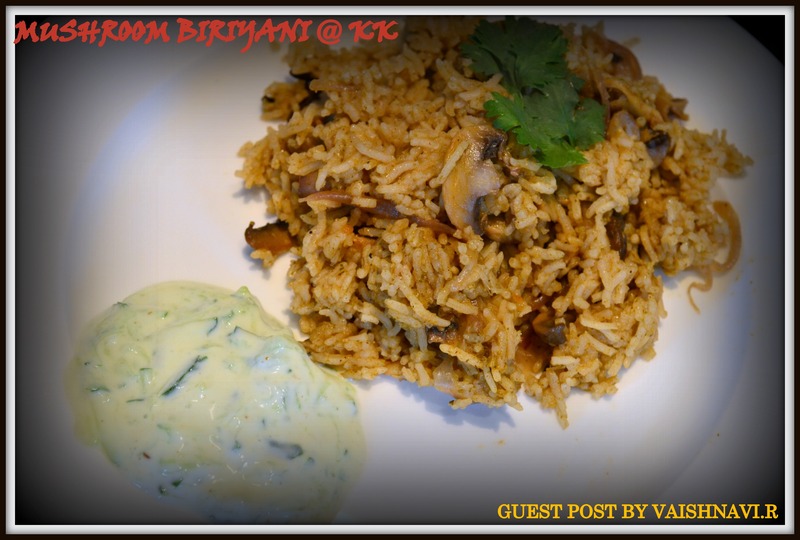 13.I like serving mushroom biryani with some cool cucumber and mint raita. Basmati rice varies from brand and country. For me this ratio has suited well. Depending on your brand of basmati rice, please adjust water so that the rice is cooked, but doesn’t get mashed. Adding Ginger garlic paste into the ghee before sautéing the onions gives better flavour but I add after onions to avoid the risk of burning it which leads to a bitter taste. Some people (like my mom) don’t like the taste of curd in their biryani. In this case you can add a few drops of lemon juice as an alternative. A good tip to check if you have added the right amount of salt into your biryani is to taste the water after mixing it well. It is important to use a fork to fluff the rice up as fork will not mash the rice and keep the grains of rice separate. Hats off Vaish to your very clear writing and absolutely clear images 🙂 Thanks again and I hope you are happy about the presentation. Thanks Kalyani for the honor! I thouroughly enjoyed the process of cooking and writing out this recipe. I hope all your viewers enjoy it too.